The Islamic Society of North America (ISNA) engages in frequent interfaith programs with Jewish groups and has been embraced warmly by the Obama administration as a contact point for the American Muslim community. In those circles, ISNA presents an open and progressive face of Islam that is led by a woman, Ingrid Mattson. Literature available at ISNA's annual convention last month in Washington, however, offers a far different vision. Books and pamphlets obtained by the Investigative Project on Terrorism from ISNA's July national convention feature numerous attempts to portray U.S. prosecution of terrorists and terror supporters as anti-Muslim bigotry; dramatic revisionist history that denied attacks by Arab nations and Palestinian terrorists against Israel; anti-Semitic tracts and hyperbolic rants about a genocide and holocaust of Palestinians. Previously, the IPT exposed hate speech during a conference panel that featured a call for "more jihad" along with slurs against Jews and gays and a defense of the terrorist group Hizballah as an innocent player subject to incessant Israeli onslaught. ISNA made no comment about pro-Hizballah comments by author Cathy Sultan, who said she could "see no reason why Hizballah should not remain armed." It feigned ignorance about invited speaker Warith Deen Umar's radicalism and bigotry, even though his book was available at the convention and is excerpted on Umar's own website. The Palestinians' Holocaust: American Perspectives by Mauri' Saalakhan. The book is a collection of essays, including some by Saalakhan, which include comparisons between Nazi concentration camps and Gaza; claims that the genocide in Darfur is both exaggerated and a product of Israeli provocation and that the "Jewish-Zionist lobby" in America is so pervasive, it even controls Keith Ellison (D-MN), the first Muslim elected to Congress. Leaflets condemning the Hamas-support convictions of the Holy Land Foundation and five former officials in November along with the convictions of the Fort Dix 5 on charges of conspiring to kill U.S. soldiers and the ongoing prosecution of alleged Al Qaeda terrorist Aafia Siddiqui. Reprints of letters from Hamas leaders Mousa Abu Marzook and Ahmad Yousef stating the terrorist group's positions toward the United States and its refusal to recognize Israel's right to exist. In The Palestinians' Holocaust: American Perspectives, an introduction says the book "features a myriad of diverse voices, whose individual and collective observations will no doubt underscore why the plight of the Palestinian people must be seen as a genocide and present day holocaust!" Picking up that theme, Professor Francis A Boyle describes his visit to the Dachau concentration camp. The town of Dachau was so close to the death camp, he writes, that it was impossible to believe residents didn't know about the mass murder taking place inside. Boyle had the same reaction as he traveled through the West Bank and Gaza in 1986 "in order to investigate Israel's atrocities and war crimes against the Palestinians." He claims that Israel and the United States "are striving to consummate a Middle East version of the Munich Pact that will sell out the right of the Palestinian people to self-determination." "How does Israel factor into the equation? It is a known fact that Israel has a strong presence in different parts of the continent – especially in the Horn of Africa. It is also a well known fact that Israel – like the Islamophobes at the highest levels of the U.S. government - desire nothing more than controlled chaos in the Muslim world. This was the first thought that came to this writer's mind when Ethiopia (and the U.S.) attacked Somalia in December 2006." "The Zionists and their supporters have made him into a lightning rod for controversy since his public statements on the holocaust and the State of Israel." "He is has a fairly progressive legislative history, however, on the Arab-Israeli conflict he has not shown himself to be much different from other American politicians; which is to say, the Jewish-Zionist lobby has its inordinate influence within his office as well. (We pray that this will soon change.)" "Solely because the humanitarian relief that this organization had consistently brought to the needy people of Occupied Palestine was construed as 'funding terrorism' against the state of Israel." A flyer from the Muslim Legal Fund of America similarly cast HLF as an innocent supplier of humanitarian aid to needy Palestinians and condemned the HLF conviction, demanding "this un-American & Unjust Verdict [that] must be appealed." In fact, the defendants were charged with violating American law prohibiting support for terrorist groups, including Hamas. Evidence from the trial showed the men supported Hamas' activities and were part of a broader effort to support Hamas with "media, money, men and all of that." Other evidence shows the defendants knew that the Palestinian charities where HLF routed more than $12 million were controlled by Hamas. The Palestinians' Holocaust was one of several books and pamphlets at the ISNA conference espousing conspiracy theories that portrayed the defendants as victims of a government out to get Muslims. "With its propaganda-like quality, the evidence was clearly intended to provoke an emotional response. For example, jurors were repeatedly shown videos of grisly suicide bombings that none of the defendants were in any way connected to, or accused of planning." Jurors did see the bloody aftermath of Hamas attacks. But they also saw repeated examples of the defendants praising such violence, and even acting it out. ISNA was included on a list of unindicted co-conspirators in the case and evidence showed that HLF used ISNA bank accounts to route money to the Middle East. Similarly, HLF board member Jamal Badawi was individually listed as an unindicted co-conspirator for his role as a fund raiser for the defunct HLF. Similarly, a flyer from the "Fort Dix 5 Support Committee" argued the five men convicted of conspiring to attack Fort Dix and kill soldiers were victims of government entrapment. The men were convicted, the flyer said, because "the tactics and strategies of the prosecution in these cases have stretched legal concepts beyond the point where a fair trial is possible." The defendants were arrested as they met with the informant to buy M-16 and AK-47 rifles to use in their planned attack. Similarly, accused Al Qaeda terrorist Aafia Siddiqui is also portrayed as a victim of the U.S. government's abuse of Muslims. For example, literature from the Muslim Legal Fund of America ("MLFA") distributed at the conference sought donations for Siddiqui's defense fund. Siddiqui is charged with plotting to kill American soldiers and federal agents in Afghanistan and has been found competent for trial. 9/11 mastermind Khalid Sheikh Mohammed allegedly told interrogators that Siddiqui was an Al-Qaeda accomplice and facilitator. The Office of the Director of National Intelligence asserts that Siddiqui was also tied to Pakistan Al-Qaeda operative 'Ammar al-Baluchi. He gave her orders to travel to the U.S. to help facilitate other Al-Qaeda operatives entry into the U.S. in order to carry out terror operations and married her shortly thereafter in 2002. The MLFA claimed that she was a "Victim of the 'Global War on Terror'" and alleged that she had been abused in custody. "Palestinian use of violence cannot be understood without reference to this basic historical fact. The conventional American view is analogous to criticism of Native American assaults on White settlers, while ignoring their underlying dispossession." That, along with Salaakhan's book, is among the attempts to cast the Palestinians as victims of a holocaust or genocide. The Nazi Holocaust sought to eliminate European Jewry and succeeded in killing 6 million Jews. The Armenian genocide left 1.5 million Armenians dead among a population of 2.5 million people. According to the Israeli peacenik group B'Tselem, 4,608 Palestinians were killed by Israeli forces in the Palestinian territories between September 2000 and March 2008. Another 67 were killed within Israel. Meanwhile, the Palestinian population of the West Bank has increased more than fourfold and the Arab population inside Israel sixfold. The Arab population of Gaza is more than 15 times larger than in 1949. See here. "It is a known fact that Israel has a strong presence in different parts of the continent – especially in the Horn of Africa. It is also a well known fact that Israel – like the Islamophobes at the highest levels of the U.S. government - desire nothing more than controlled chaos in the Muslim world. This was the first thought that came to this writer's mind when Ethiopia (and the U.S.) attacked Somalia in December 2006." Despite all this conspiratorial, anti-U.S. dogma, the State Department's www.america.gov web portal continues to function as a veritable PR machine for ISNA, publishing monographs and posting articles like this, this, this and this, in which ISNA officials are treated as if they represented a mainstream organization analogous to the Anti-Defamation League, the U.S. Catholic Conference or the NAACP. In a panel discussion which followed the film, ISNA President Ingrid Mattson said "Journey into America" was "refreshing" and would dispel irrational fear that many Americans have about radical Islamists organizing at mosques: "There are many Americans who are really frightened of what might be going on behind the doors of the mosques. So to get in and to hear what is in those people's minds, it takes away the strangeness of it." The true measure of character is determined by what is said and written when people think no one is paying attention. 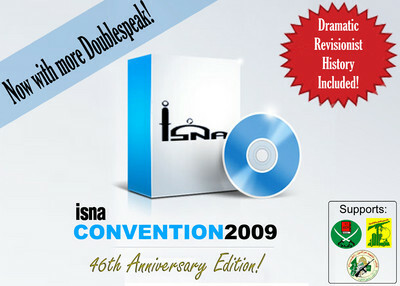 The literature promoted at last month's convention shows we may not really be seeing what goes on behind closed doors with ISNA.